Are you tired of trying to remember the combination to your safe? Want to ensure that nobody else has the combo to your safe? Here at Black Hawk Lock & Key we perform safe combination changes for residential and commercial customers throughout Rochester and Pittsford, NY. Can’t Rember Your Safe Combo? We can change the combination on any type of safe lock be it an analog dial or a digital keypad. Whether you purchase a new safe directly from a locksmith or safe distributor, buy a used safe from an auction, or end up owning a safe that’s built into your home, chances are good that the pre-set combination isn’t one that you would have selected. Our fully licensed and insured locksmith has the hands-on experience and tools required to perform safe combination changes on virtually any make or model of safe. 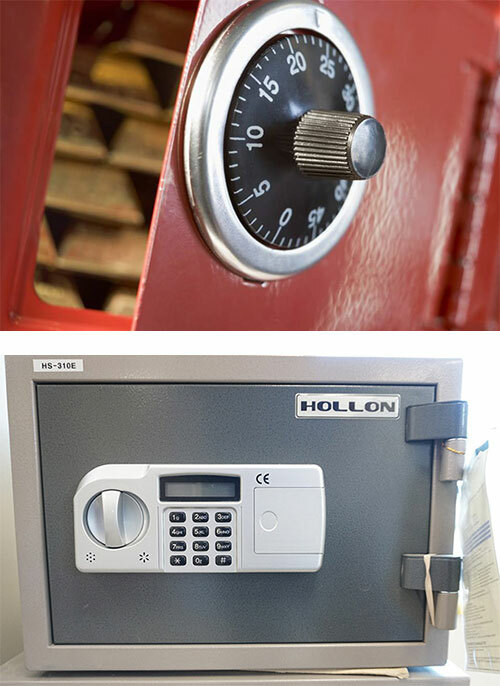 We can reset the safe combination on portable fire safes, gun safes, and even built-in safes. In many cases, a unique lock change key is needed to change the locking combination on both dial and digital safe locks. As a registered and bonded locksmith, we are able to access the necessary lock change key directly from the manufacturer of your safe. If you happen to own an antique safe or a safe made by a company that has gone out of business, completing a safe combination change may involve having our locksmith fabricate a brand new lock change key for your safe. Alternatively, we can simply remove your existing locking mechanism and replace it with a brand new combo or digital safe lock that’s set to a combo that you pick. Want to Replace Your Dial Lock With a Digitial Keypad? Have an old safe with a dial combination lock? Want to upgrade to a digital lock safe? Before you start shopping for a new safe call us here at Black Hawk Lock & Key. We have the specialized experience it takes to upgrade your old dial combination locking mechanism to a digital keypad that can be programmed to a combination that you pick out. We can even upgrade your existing dial lock or safe keypad lock with a cutting-edge biometric lock that requires fingerprint authentication to open, and we also have access to Bluetooth-enabled smart safe combination locks that adds an extra layer of security for your valuables. When you need the combination on your gun safe, wall safe, drop safe, or any other type of safe changed, call us here at Black Hawk Lock & Key. We offer honest, affordable mobile locksmith service throughout Rochester and Pittsford, NY, and we’re committed to providing you with exceptional service that’s guaranteed.